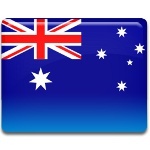 September 3 is Australian National Flag Day. This day commemorates the day when the Australian National Flag was flown for the first time in 1901. Then Prime Minister of Australia Edmund Barton held a competition to design a flag of Australia. On September 3, 1901, the winner was announced and the Australian flag was flown over the dome of the Royal Exhibition Building in Melbourne. The idea of celebration of Australian National Flag Day belongs to John Christian Vaughan, who proposed observe the day on September 3 in 1984. That year a public ceremony was held in Hyde Park, Sydney. Vaughan continued advocating the observance over the next years. He encouraged the state branches to promote the observance of the day and organize different ceremonies for general public to participate in. The popularity of the observance continued to grow and the Governor of New South Wales, Sir David Martin, delivered a Flag Day address at Tumbalong Park, Sydney in 1989. An official ceremony took place in the Martin Place Amphitheater in the center of Sydney in 1996. Since then annual ceremonies are held in schools and major centers. Regardless its popularity, Australian National Flag Day is not a public holiday.